I have absolutely no idea what they are talking about. At all. I have a good job, I pay my bills, I have good credit, I am planning for retirement, I maintain my responsibilities and follow through on commitments, I try to be diplomatic, I floss (sometimes), and I generally have a low carbon footprint. All these things qualify me for maturity right? Watch them and re-assess my (and your?) maturity level. EMBRACE IT. Last week, World of Facts! (AKA Mr. StyleBaby), our friend Darrell (sorry, Darrell, I don’t have a good nickname for you yet!) and I made a great autumnal dinner–we stuffed a hubbard squash with seitan, apples, potato, garlic and butter and baked it with an orange juice (fresh squeezed) and sage stock. In hindsight, I would have filled the inside of the squash with stock as I stuffed it, because it came out a little dry. But I’m not writing this to talk about squash! I’m writing this to talk about Apple Dumplings. We used a recipe that had been passed to my mother by my paternal grandmother-and it was probably given to her by her mother. My family lives far away, but we’ve always placed great value on cooking and eating together. Making dishes like this help me feel closer to them–especially when I can share them with my loved ones. These dumplings remind me of winters by the lake in Minnesota and are best savored when there’s a slight chill in the air. Cut up 4-5 apples into 1/4 in pieces and set aside. We threw a nectarine in the mix and it was lovely. Whisk 1 1/2 C sugar, 1 1/2 C water, 1/4 tsp cinnamon, 1/4 tsp nutmeg in a saucepan. Bring to brisk boil, remove from heat after three minutes and set aside. 1/2 C milk and 2 tbsp sugar. If the dough is too wet, add flour as needed-it really depends on the temperature of the room. dumplings are in the dish, bring the syrup to a boil again, whisk it, then pour it over the dumplings. When done pouring, pop the dish in the oven for thirty minutes or until golden brown. Plate while hot and serve with about 2 T of milk or cream over each dumpling. To make a vegan version of this dish, substitute butter for shortening or earth balance, and use almond or rice milk instead of dairy. I cannot believe how catchy this gets once you’ve heard it for a bit. ..and Eleanor Roosevelt kept me awake all night chewing my toes and walking on my head. I am THIS CLOSE to being a Cathy cartoon today. Good thing I’m supposed to go see Iron Man tonight. Eleanor Roosevelt was totally hot. I adopted a cat! 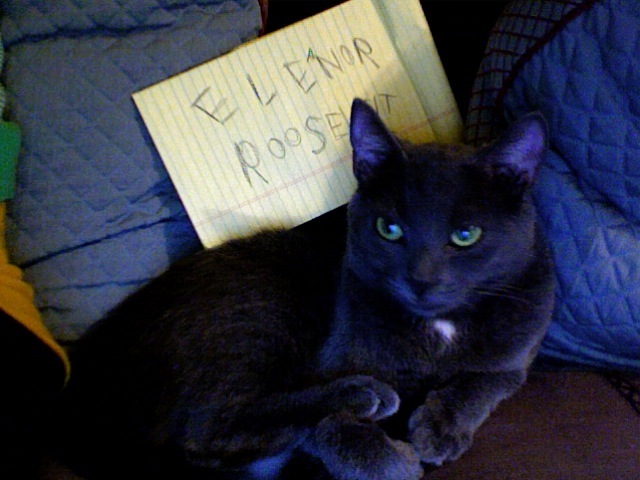 She is gray and sassy and I believe that she is like the cat version of Bea Arthur. She also looks like a black cat that has been rolling around in powdered sugar or talcum powder or cocaine. My cat is a coke head and I love it. Also, I have to say, watching a boyfriend who has never had a pet get really into playing with a cat is quite cute. She can also kill flies like an iguana. It’s amazing. Can you sense my glee?